Blurb: Every single night that summer I lay awake wishing my life were different. And then one day it was... but not in the way you probably think. “Different” for Amy was moving from city to her aunt’s trailer in the country - starting her senior year at a new high school, putting the pain of a broken relationship behind her, starting fresh. “Different” was Henry, a teenage boy Amy meets in the clearing behind Aunt Mae’s. Henry dresses differently, talks differently and treats her better than any guy she’s ever known. And she’s starting to fall for him. But Amy is stunned when she finds out just how different Henry really is. Because on his side of the clearing, it’s still 1944. By some miracle, Henry and his family are stuck in the past, starving off the tragedy that will strike them in the future. Amy’s crossing over to Henry’s side brings him more happiness that he’s ever known - but her presence also threatens to destroy his safe existence. 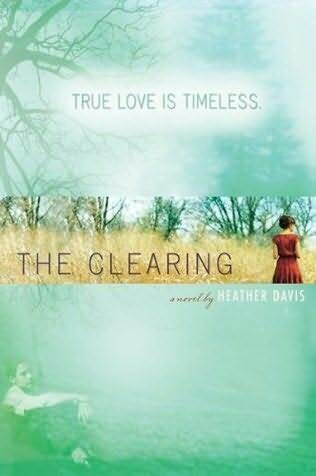 In this touching tale about falling in love, finding strength, and having the courage to make your own destiny, two teens living decades apart form a bond that will change their lives forever...and learn that true love can be truly magical. Review: This novel was gentle as it walks the reader through a mystical romance separated by time. The main character, Amy, was unhappy with her life and moved away to stay with her Aunt. There she finds true friends, a true love and a more caring family relationship with her Aunt (that her mother daughter relationship lacked). By the end of the novel Amy had grown and developed enough to be able to face her fears however throughout the novel I found that I had few connections with her and so could not relate to the novel as well as I would have like to. On the positive side I did like it how the novel captured the idea that maybe people are suited to different eras rather than the one they were born in. Also Heather Davis created and described the setting for the novel vividly. I would recommend the novel to any reader of romance as the story contains timeless characters, especially the attractive hero Henry who displays many lovable and desirable qualities. I love the premise of this book. I also love the idea of people being born suited to different eras. very cool. Yes, I think we often underestimate just how hard life would be without technology. We also tend to romanticize history when most of the time everything was just dirty and dangerous.